A quote that stood out when I watched the "Learning Stories" video. The photo is from my class of three years ago, with some of the first documentation I'd made with the class using "pic collage" hanging on the wall (top right). The two students pictured were looking back and forth from the wall to the overhead platform, while discussing the curious phenomenon of the shadows made by the opaque and colourful glass objects they were manipulating. The quote speaks to facial expressions which (though not shared here out of respect for student privacy) in the original version of this photo were quite telling; K (with the pink sleeve) had a perplexed look as she pointed at a seemingly clear glass gem which nonetheless cast a dark shadow. I had a lightbulb moment recently, regarding my understanding and practice of documentation. 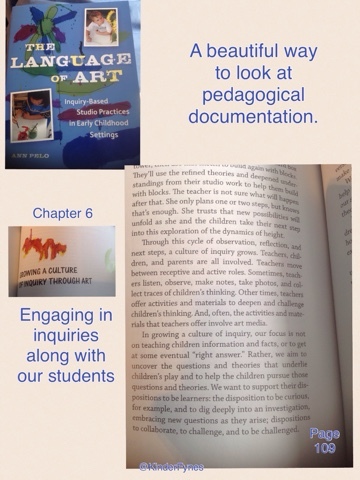 I had for some time been struggling with using the term "pedagogical documentation" in reference to my own work. 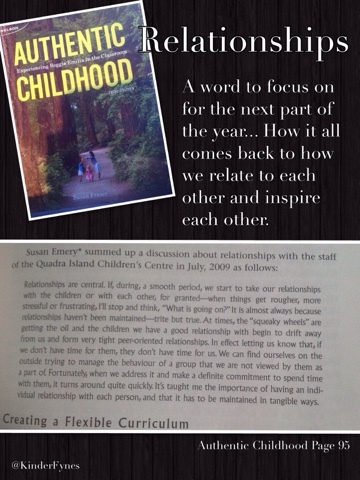 I'd been exploring articles, blogs, reading books and joining in #ReggioPLC chats on the subject. I worked this past year as part of a collaborative of Kindergarten educators, both ECE and OCT, as we created professional development workshops/networking opportunities for fellow early years educators in our south PDSB region. Lastly, I attended professional development including the powerful and transformative discussions at Charles Sturt University's "BECS Conference" this spring: "Documentation as Relationship". All of this was occurring in a year when my school transitioned to Ontario's full-day Kindergarten Program, and thus I transitioned from being the single educator in the room. So many changes in my practice: one class all day instead of two, a fantastic new partner, Pooneh with whom to share the journey (see here for story), in fact an entire new team of ECE teachers expanding our Kindergarten team to twelve. A bit of history, before this year: as mentioned above, I had read articles defining the what and how of pedagogical documentation. 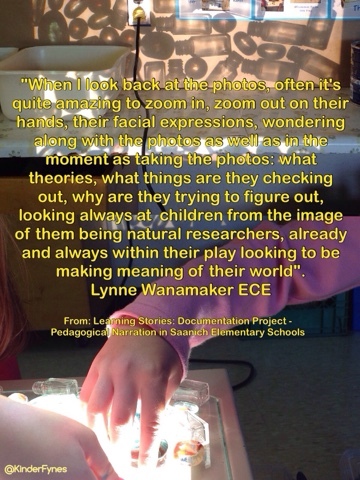 The touchstone piece for me remains Carol Anne Wien's "Learning to Document in Reggio-inspired Education". 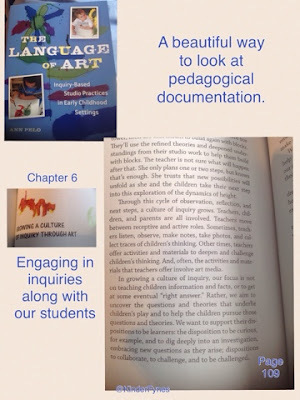 In the article the author refers to "a progression in teacher understanding of pedagogical documentation" which is outlined as "five typical aspects of the progression toward sophisticated pedagogical documentation". Upon first reading some years ago as part of the Kindergarten AQ class I was taking, I felt myself solidly at the beginning phase of the journey as outlined by C.A. Wien. A few years later, the next time I read the article, I felt myself beginning to get a better handle on interpreting the messages I was seeing, and improving in how to share our stories as well. Somehow though, the reverse was also true: as I learned more and saw more examples of documentation as shared by educators in Ontario and all around the world, I became more doubtful that I was on track. I felt intimidated by beautiful or simple presentations of ideas that so succinctly told a story. I wondered what I may have missed, what I privileged with my choices, and if I was having too strong a voice (thus not raising that of the students). In many online chats I discussed ideas around this term both with the "ReggioPLC" and on my own, but really didn't think what I was doing was the transformational work I saw in articles highlighting excellence in practice in Reggio Emilia. I saw inspiration around me, such as the simple and utterly poetic visual storytelling my team partner Lada created with her students a year ago when our classes at Thornwood PS reared butterflies. I believed I was making real connections with students through the process, but still wondered if I was really "doing it right". Thus my year of purposefully studying documentation began, as I finished my last year of 1/2 day teaching and thought about all the changes ahead. This last year of teaching has been rich with new learning for me. I began teaching Kindergarten in 2004, yet it seemed like a steep learning curve ten years later, as we learned to navigate through so many new daily transitions. Pooneh and I watched and listened to students carefully. We saw when our students were comfortable with more time and space together, and when we needed to reel various groups back in and reflect on the social struggles we were noticing. We tweaked our meeting times, and early in the year tried splitting the class into two groups with simultaneous meetings in opposite ends of the room. We allowed for plenty of choice, and also noticed when individual students needed support in making choices. We learned along with our students how to be so many learners in a classroom. I don't think we ever had it working perfectly for every student and educator, but it certainly became a joyous learning community where many ideas came to fruition. It is a valuable thing to look back and see how much growth and change took place. A particular focus of my learning has been on our shared teaching relationship. As we learned to work both together and yet separately (allowing ourselves to respond to different sparks in the room), we talked about what we were seeing and how to bring highlights from the exploratory play time back to the large group. We joined in play and looked for inquiries that could expand to include many if not all in the class (these inquiries didn't really begin to grow organically on their own until late fall/winter). A post from a twitter friend about "my one word" (a sort of New Year's Resolution for growth) prompted me to go back into a book I'd read and find a passage I remembered as particularly meaningful. I didn't think about it for more that a moment, but it wound up being an apt choice. It doesn't surprise me that amidst so much change I would need a solid goal to anchor me. My stated goal was to work on relationships, something I shared with friends many times over the year in chats. I had entered the year with the intention to forge a partnership with my co-teacher, but it occurred to me that it was more than that, more than my relationships with students, too. In creating a community of learners who share inspiration and build upon each other's ideas, I saw the importance of relationships amongst students and with the materials in the classroom. It became evident to me that I was truly interested in examining the "environment as third teacher" as outlined by educators from Reggio Emilia. Seeing a relationship with the environment put me squarely in "Hawkins" territory, and inspired me to go back through my readings and video clips to find more "Hawkins-inspiration". All my seemingly disparate inspirations (David and Frances Hawkins, Reggio Emilia pedagogy, the growing forest school movement) were coming together in a way that made sense. It wasn't a practice to be adopted in whole, there wasn't some "thing" I was supposed to do that would transform my teaching. It was all in the process - no different than how I knew students were learning. What follow are some of the ideas that had an impact on me over the year, informing my view of what I was doing while practicing an emergent curriculum with my teaching partner. Often a quote so resonates I copy it verbatim (often from video clips, requiring multiple viewings to catch each word) and share with an image from our class that seems to speak to that idea, for me. 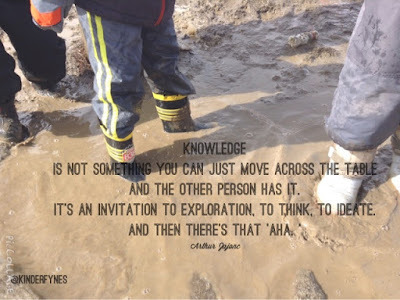 Like the light exploration photo at the beginning of the post, the image of full-body participation in the mud play below reminds me of the importance of being fully present in learning: all senses engaged in following questions that arise. Learning in a puddle: How deep is the puddle? How sticky is the mud in the middle, on the edge? If my boot gets stuck, can I get my foot back in without falling over? If I stomp, how high will the puddle splash? And so I end here, not with any summary or final thought, because this post was created as an introduction to a series of posts exploring documentation through the eyes of people whose work has caught my eye, inspired me, and pushed my thinking. Over the year I've reached out a few times to those in my PLN whose documentation spoke clearly, and I asked if they'd be willing to share their documentation and stories here on my blog. A few of those I asked tentatively agreed, with the proviso that it would be when they were ready. I was delighted. The first of those posts will follow this, a guest post by a faraway friend Christie Angleton whose documentation panel about "risky play" made my heart leap when I saw it. I welcome comments about documentation that inspires you, the reader, as Christie's inspired me. I welcome feedback and ideas, as well, if you're moved to share and would like to be a guest in this series too. I found this quote as I was proofreading, and found it prophetic. A practice of how we observe. Love this! I too am on a journey looking at using pedagogical documentation with my 1/2 class and feel like the deeper I go, the more questions I have! Thanks so much for sharing! Thank you Lora, I definitely relate to that, I feel like I'm spiralling deeper and deeper into the subject. Curious to know more about what it looks like in your class, as your students are older and likely capable of much more self-documentation. If you wish to share, I'd love to feature your thoughts, too! It's so interesting to teach. Not only are the children learning, but the teacher is learning also. I must be fascinating watching them explore, learn, perceive, and grow. We tend to forget as adults what it's like seeing things for the first time is like. There is a sense of wonder and curiosity that we lose as we get older.